The defender will return to his homeland at the end of his Celtic contract. 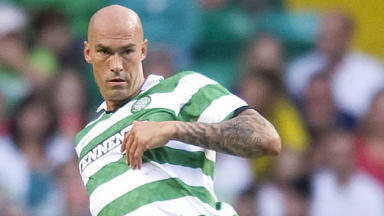 Celtic defender Daniel Majstorovic has agreed a move to AIK Stockholm and will return to Swedish football this summer. The centre-back is out of contract at Parkhead and has committed to a two-and-a-half year deal with AIK, beginning in August, the Swedish club has confirmed. Majstorovic injured knee ligaments in a freak training ground accident in February and has not played since. The 33-year-old had insisted that he would concentrate on his recovery before deciding on his future. With the Swedish transfer window closed until August 1, Majstorovic has now agreed to join AIK for their new campaign. "It is with great pleasure and pride that I will wear the AIK shirt," he told the club's website. "It feels incredibly inspiring and affordable to be a part of the exciting projects AIK face. "I have great hopes for the future with the club and look forward to the next two and a half years. Now it's full speed ahead." Majstorovic joined Celtic in 2010 from Greek side AEK Athens. He made 64 appearances for the club, scoring twice. Goalkeeper Dominic Cervi also confirmed on Tuesday that he would be leaving the club.